are held at our Sherman Oaks studio. What instruments to you teach at Join the Band? 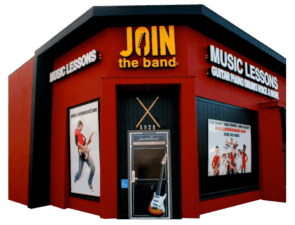 Join the Band’s staff of experienced university trained teachers offer in studio private music lessons for guitar, piano, voice/singing, drums, bass guitar, and ukulele. Since we have a very experienced staff of teachers, we can offer music lessons for all ages, levels and styles. We welcome beginners! If you are just starting out with lessons, we will design a lesson program to meet your goals. If you are an intermediate to advance student, our teaching staff can help you hone in your skills, and get you playing at a very advanced level. What are the benefits of taking private music lessons at Join the Band? We have over 30 years of experience teaching music lessons, in the Sherman Oaks area of Los Angeles. Private music lessons provide students the fastest road to improvement and a more rewarding, enjoyable experience with their instruments. Our talented staff of university trained and experienced teachers are well qualified to teach beginner through advanced levels in a variety of styles including rock, jazz, blues, classical, pop, classic rock, heavy metal, alternative, country, bluegrass, reggae and more in a professional studio environment. All we do is teach music lessons and band performance classes. We are not a retail store selling instruments or music. This allows us to focus on providing our students with the best possible private music lessons. In 1998 we started as a very small band performance program. To date, we have had over 3000 band performances at our Join the Band concerts with well over 1000 students participating. Our studio is always being updated with new equipment to ensure our students get the best possible music lesson experience. Where is Join the Band located? Our music lessons studio is centrally located in the San Fernando Valley, Los Angeles community of Sherman Oaks, 5928 Van Nuys Blvd. We serve the communities of Encino, Studio City, Van Nuys, Toluca Lake, Valley Village and the surrounding areas. What are parents saying about music lessons at Join the Band? We feel we are the best music lesson and band program based on what our students and families have to say. We have a professional staff of university trained music teachers at our Sherman Oaks studio.